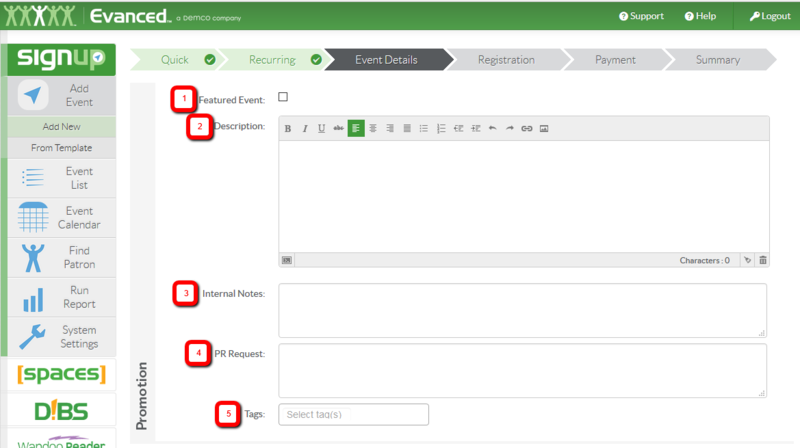 After completing the Quick Add step of event creation, you can add details to your event. The following fields can be completed in the Event Details step. These fields allow you to add additional information useful for both your patrons and staff, as well as allow you to get creative by adding images and contact information specific to the event. The use of the WYSIWYG editor within the Event Description section allows you to format your text the way you want it to appear to your patrons. These fields also accept HTML coding as well. There is also an internal PR Request field that allows for your staff to make notation of additional Marketing/Press materials that might be needed for the event. This PR Request field is report-able as well. And finally, by adding Tags to your event, you allow for patrons and staff to search out the event more easily using key words. 2. Description Describe the event and give relevant details to patrons. 3. Internal Notes This is where you include setup information or other private information that patrons won't see. This information can then be retrieved in a report. 4. PR Request Run a specialized report with details like library location that aren't useful for the public calendar, but might be great for wider broadcast on TV, radio or a newspaper. 5. Tags Increase the searchability for staff and patrons by adding tags to an event. Additionally, there is the details section as well. 1.Contact Enter the contact information for the organizer of the event. 2.Presenter Select a presenter from the previously created presenter list. The presenter may or may not be the same as the contact. You can also type in your own presenter if the name is not currently on the list. 3.Image We always recommend using images with your events whenever possible. Images can be a great way to visually grab attention to the event or help a patron to quickly recognize recurring events. A great way to host and store images for your events is within the Image Uploader. Please note that images larger than 125px X 100px will be cut off until the user selects "See More". For further information on houw to use the image uploader click here. From here you can save your event or continue on to a different step. Posted - Tue, Apr 24, 2012 at 3:30 PM. This article has been viewed 2573 times.